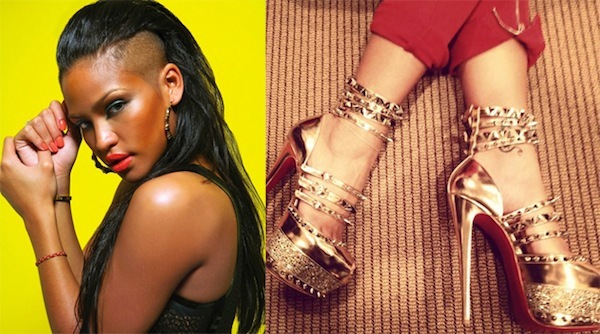 Hot Hot Hot, I love Cassie shoe game. All the stars will be out for music’s biggest night, the 54th Annual Grammy Awards which will be held Sunday night (Feb. 12) at the Staples Center in Los Angeles, CA. Model/singerCassie via her twitter gave us a sneak peek at what she will be wearing for the night, an exclusive pair of Christian Louboutin gold mirror spiked ankle strap platform heels with the caption reading “Pre-Grammy dress up #takethat”. What do you think of her spiked out footwear choice?